Chiropractors specialize in helping the body relieve itself of pain. Through methods like spinal adjustments and cold laser therapy, Premier Health Chiropractic has been able to combine the traditional ways of our industry with the latest technological advancements. One of our more popular, non-invasive methods of treatment and pain relief is Electric Muscle Stimulation. 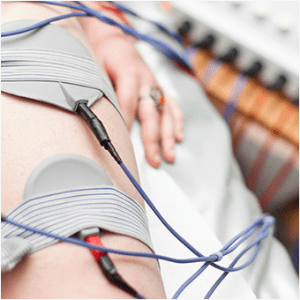 What is Electric Muscle Stimulation Therapy? Electric Muscles Stimulation works by sending small amounts of electrical currents to the affected soft tissue area. Boost the tissue’s healing process. All of this is done during the course of a 10-20-minute session. Most patients will merely feel a slight tingling sensation before the positive effects begin. Because of the treatment’s versatility, chiropractors can use it to address a variety of symptoms around the body. How Do You Know You Need Electric Muscle Stimulation? One of the first things you’ll notice when you come to our North Dallas location is the caring, friendly staff and welcoming atmosphere. We know that chiropractic medicine can lead to a person’s improved overall wellness, which is why we continuously build rapport with each patient and work with them as they strive to achieve their true health potential. Contact us today to schedule a free consultation.